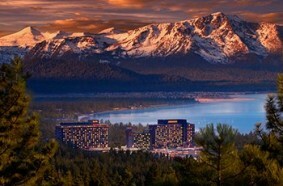 Harveys Resort & Casino is located on the pristine shores of America’s largest alpine lake, Lake Tahoe. Featuring six restaurants, a full-service health club, pool and convention center, cabaret theatre with the hottest entertainment, wedding chapel and arcade. Harveys Lake Tahoe is the perfect vacation destination! Be sure to check out The Cabo Wabo Cantina Sammy Haggar’s popular hotspot, Lake Tahoe’s Hard Rock Cafe and the Sage Room which has become a landmark since its opening in 1947 offering an elegant Western-themed steakhouse. Take in Harvey’s popular comic shows at The Improv for an evening of laughs.